Plants are autotrophic and make their own food via photosynthesis. However, they must acquire the molecular building blocks for the production of food from the environment. Carbon dioxide (CO 2 ), water, and a variety of minerals are needed for photosynthesis to occur. While CO 2 comes from the air, all plants get the majority of their water and minerals from the soil via their roots. In addition, roots provide structural support for the plant. Moreover, roots can serve as storage houses for the food produced by the plant. Roots also act as the gatekeepers for the plant by actively regulating the entry of substances into the plant body. The root system of a plant. Examining the anatomy of a root reveals a highly organized set of cell types that reflect the main functions of roots previously mentioned. The exterior of the root is called the epidermis and is composed of dermal tissue, made up of epidermal cells. Some of these epidermal cells have long membranous extensions called root hairs. Root hairs increase the surface area of the root, maximizing water and mineral absorption. Immediately interior to the epidermis lies the root cortex. The parenchyma cells store nutrients and are also involved in mineral uptake. In roots that are designed for storage, these cells are numerous and are filled with the carbohydrate products of photosynthesis (starch). The innermost layer of the cortex, surrounding the vascular tissue (stele), is the endodermis. A waxy material called the Casparian strip surrounds each individual endodermal cell. This structure acts as a gasket, creating a seal to limit diffusion of water and minerals into the vascular tissue of the root. Due to the presence of the Casparian strip, all water and minerals must pass through endodermal cells, not around them, before entering the vascular tissue of the plant. This allows the endodermal cells to regulate the entry of nutrients and other substances into the plant. Finally, xylem and phloem occupy the central region of the root. The xylem transports the water and minerals absorbed by the root up to the stems, leaves, and flowers. The phloem transports the sugars and other nutrients made by the leaves down to the root for immediate use or for storage during periods of dormancy. Most root systems have microorganisms that are living in or near them in symbiosis . These microorganisms help the root absorb and process nutrients that are needed by the plant, while the root delivers food made by the plant to the microorganism. Nitrogen-Fixing Bacteria. Many of the minerals needed by the plant are readily available in the soil in forms that the plant can use (including calcium, sulfur, sodium, chloride, and potassium). However, nitrogen in the environment is in the form of nitrogen gas. Plants cannot convert nitrogen gas into ammonia or nitrate (nitrogen forms they can use to build proteins ). However, many microorganisms that live in the soil (and some that live in the root cells of some plants) have the proper enzymes to convert nitrogen into ammonia or nitrate. These bacteria are called "nitrogen-fixing" because they capture atmospheric nitrogen and convert it into a usable form. Some plants, notably the legumes such as soybeans, house specific nitrogen-fixing bacteria with their roots in specialized structures called nodules. Mycorrhizae. In addition to their symbiotic relationships with bacteria in the soil, roots have symbiotic relationships with fungi. Particular types of fungi can infect the root epidermis and provide the plant with phosphate that it cannot acquire on its own. Roots that have these beneficial fungal infections are called mycorrhizae. As there are many different types of plants, there are many different types of root systems. Each system is structured to serve the needs of the plant body, based on the metabolic demands of the plant and the environment in which it lives. Taproots. Taproots are roots that are specialized for reaching water deep in the ground or for storing the nutrients produced by the plant. Many eudicots such as sugar beets and carrots have taproot systems that are specialized for storage. In fact, the most familiar part of the carrot (the orange, edible portion) is a taproot. In addition, conifers (evergreens) that live in climates with harsh winters have taproot systems. During the winter months the water in the upper layers of the soil is frozen and inaccessible to the plant. The taproot system in these plants can grow to access available water sources in deep layers of the soil. Fibrous Roots. Fibrous root systems consist of an elaborate network of small roots that spread throughout the upper layers of soil. Most monocots, such as grasses, have fibrous root systems. These roots allow the plant to access a large area of soil water and minerals. The mat-like formation of fibrous roots provides a strong anchor for the plant and also preserves the integrity of the top layer of soil by preventing erosion. Adventitious Roots. 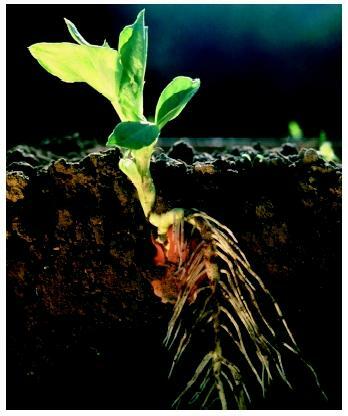 Both taproots and fibrous roots are root systems that arise at the base of the plant shoot during germination. However, it is not uncommon for roots to develop from plant structures such as stems or leaves that are aboveground. These roots are called adventitious roots and mainly serve both support and conductive roles. Atlas of Plant Anatomy. <http://atlasveg.ib.usp.br/English/> . Moore, R., W. D. Clark, and D. Vodopich. Botany, 2nd ed. New York: McGraw-Hill.